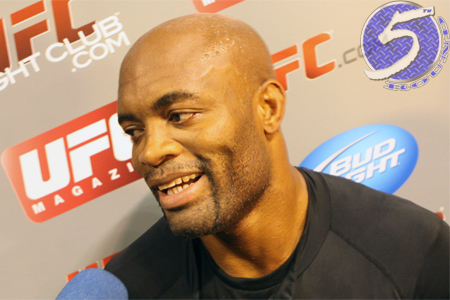 When news broke Tuesday that former UFC middleweight champion Anderson Silva (pictured) was hospitalized with severe back pain and lost feeling in his legs after practice, some wondered if Silva’s collapse was related to the surgical procedure he underwent to fix the broken shin he suffered 11 months ago. Rest assured, fight fans. According to Dr. Marcio Tannure, the Silva’s personal physician, lumbago, which is described as pain in the lumbar region, is nothing new new for Silva. Tannure said this latest setback will keep his patient out of the gym for 10 to 15 days. Physiotherapy and ant-inflammatory medication are also on the docket. Silva will make his anticipated return to action January 31 against Nick Diaz at UFC 183. Tannure is confident the 39-year-old Silva will keep his appointment.